IFaware - Dogged By Cash Flow Problems? The latest bunch of hapless Lord Sugar wannabes kicked off this season off the BBC's #TheApprentice a couple of weeks back. In the second week they demonstrated even less than the normal amount of business accumen, when both teams failed the advertising task. This week saw them taking over part of Liberty of London and, as usual, ignoring the advice of experts sent to help them e.g. having a live model in your shop window increases sales by 30-40%"! However, the thing that caught my eye, right at the end, was the trailer for next weeks edition. The candidates are going to be tasked by Lord Sugar with putting together a crowdfunding proposal! Crowdfunding has now made BBC1 prime time, which will no doubt increase its exposure even further. This is a complete deviation from the normal tasks set by Lord Sugar, and it just goes to show how mainstream Crowdfunding (CF) has become. My sadness is that the receivables financing sector is still failing to achieve a shadow of the profile achieved by crowdfunding. Our own research recently found awareness of crowdfunding advertising was nearly 6.5 times higher than that of invoice finance (IF). So it is little wonder that receivables financing is still relatively unknown. Indeed our latest research survey, about product awareness will shortly be released on this blog, revealing exactly what percentage of eligible businesses are aware of invoice finance. It will be surprising reading to many. The promotion of CF via The Apprentice is exactly this kind of profile raising promotion that has done so much to build awareness of CF. The stark difference between CF loans and IF is that with CF loans you have to make repayments, in a similar fashion to a bank loan, whilst with IF the finance can revolve such that it remains and grows with your business. OK you can also raise equity through CF, but not without giving something away in terms of ownership. IF doesn't affect your ownership at all. Yet despite these key differences, CF continues to grab all the headlines. So what about an Apprentice episode all about invoice finance? Or even a mention? Highly unlikely I suspect, but The Apprentice remains one of the best things on TV! 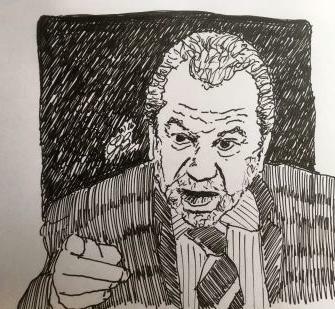 <a href="https://www.fundinvoice.co.uk/blog/invoice-finance/post/apprentice-crowdfunding-task-2016.html" ><img src="https://www.fundinvoice.co.uk/images/apprentice.jpg" alt="Lord Sugar by Glenn Blackman of FundInvoice" width="450" /></a><br /><a href="https://www.fundinvoice.co.uk/blog/invoice-finance/post/apprentice-crowdfunding-task-2016.html" >Lord Sugar</a> by <a href="https://www.fundinvoice.co.uk/" >Glenn Blackman of FundInvoice</a>. How Does Factoring Improve Your Cash Flow? Is Factoring Growing In Popularity? What Is Confidential Invoice Finance? Fed Up With Your Bank Owned Factoring Company? Is Anyone Developing Blockchain Invoice Finance? Can Anyone Explain The Benefits Of Cryptocurrency Invoice Finance? Tungsten Network Finance - Should The Invoice Finance Sector Watch Out? PNB Paribas Moves Into Invoice Financing - Again? Can You Help This Selective Invoice Finance Client? Problems With Home Ownership And Poor Credit History? New Year, New Growth Aspirations - Need Funding? How Long Does It Take To Get Invoice Finance? Need Help Paying My VAT Bill? 'Alternative Finance' - Positive Handle Or Ball And Chain? Need Help Finding Invoice Finance Companies That Deal With RPO's Such As De Poel? How Green is Your Invoice Finance? 35% Invoice Finance Cost Saving? Need More Working Capital Than Your Invoice Finance Can Provide? What Is A Recourse Period? Need Help Paying VAT Tax To HMRC? Have you been turned down for invoice finance as you are not a home owner? What Are The Minimum Turnover Size Criteria For Invoice Finance?